Euroiltec® Rail&Marine Diesel Engine Oil is a high-quality, zinc-free, heavy-duty diesel engine oil designed for use in all 2-stroke cycle and 4-stroke cycle railroad locomotive diesel engines. It also is recommended for use in railroad-type diesel engines used in marine service or in stationary service for power generation. It is formulated with a new technology, reduced ash (9 TBN) additive package that is particularly recommended for use in modern EMD and GE power units running on low or ultra-low sulfur diesel fuel. Euroiltec® Rail&Marine Diesel Engine Oil is formulated with an advanced additive technology that provides improved oxidative stability, soot dispersancy and wear protection for use in the newer, low exhaust emissions, low oil consumption railroad diesel engines. It has excellent oxidation resistance, high dispersancy and improved TBN retention to protect against deposit formation and help maintain engine cleanliness, even in extended drain or severe service intervals. It provides excellent wear protection and is non-corrosive to yellow metals. The additive package is zinc-free to protect silver bearings and bushings found in older EMD diesel engines, and is non-chlorinated to permit easier recycling or disposal of used oil. Euroiltec® Rail&Marine Diesel Engine Oil meets or exceeds the performance requirements of the LMOA Generation 5 and GE Generation 4 Long Life railroad diesel engine oil standards. The low-SAPS formulation is designed for use in diesel engines operating on low or ultra-low sulfur diesel fuel, and also is compatible with the future exhaust aftertreatment technologies under development for use in these engines. 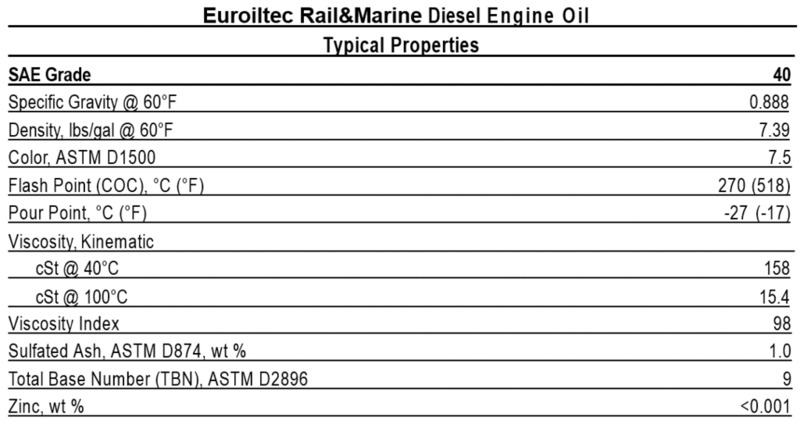 Euroiltec® Rail&Marine Diesel Engine Oil is recommended for use in locomotive diesel engines manufactured by ALCO, Baldwin-Lima-Hamilton, Caterpillar, Cleveland, Electro-Motive Diesel, Fairbanks Morse and General Electric.